Flu pandemics are important but relatively rare so the lessons learned from such events may not be available when they are most needed. This is where historical research can help. Here we reflect on some lessons that could be learnt from the 1918 influenza pandemic – building on a presentation we are presenting today at a Victoria University based conference on World War One . There have been four influenza pandemics in the last 100 years that have reached New Zealand. Of these, the 1918 one was by far the most severe – in fact it was the worst natural disaster in the country’s history with over 8500 deaths (almost one percent of the population at the time). The most recent influenza pandemic, which commenced in 2009, was fortunately much less serious (NZ experience with it has been reviewed elsewhere). Future pandemics are well worth preparing for, given the potential for severe ones to cause high death rates and overwhelm health services. Such pandemics could even pose existential risks to the future of human civilisation (pandemics are included in this list of existential risks). This consequence might be particularly plausible if influenza viruses were ever engineered into bioweapons. We have been involved in a range of studies on the 1918 pandemic and NZ and most recently the experience of NZ military forces during the pandemic. The following are some of the lessons that have emerged from this work. 1) Try to avoid crowding in institutions and other settings: The 1918 pandemic involved relatively high death rates in NZ military camps (see this recent article) and crowding in these camps was a likely contributing factor. The situation in the Featherston military camp was also made worse by some of the men using tents for accomodation (and many of these blew down when a fierce storm occurred during the pandemic period). The most severe single outbreak event in this pandemic for NZ military personnel (in terms of the death rate) was on the troopship Tahiti. Again, crowding was a problem on this troopship, but also poor ventilation of accomodation areas may have contributed to its scale and severity (see this article). In future pandemics authorities could also reduce crowding by emptying out some facilities if the time is available before a pandemic reaches NZ (eg, boarding schools, university hostels). Of course crowding is good to avoid in terms of preventing other infectious diseases in the modern era as well (see this review). 2) Consider “protective sequestration” in some settings: This action refers to control measures (eg, at a border or area boundary) to prevent the spread of infection into an area. 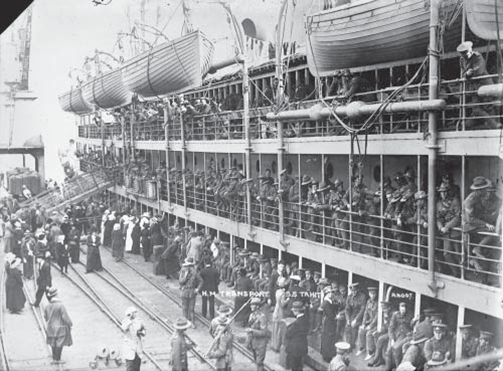 Such an attempt failed in 1918 in the case of the troopship Tahiti as the measures to prevent disease spread from the shore or other ships were inadequate. Promptly closing military camps to try to protect them was also not seriously attempted in NZ, even though such measures were successful for some schools in NZ and for Coromandel township (see also: ). Internationally some military installations successfully closed themselves off and kept out the pandemic (a naval base in San Francisco and American Samoa – the site of a US naval base). Iceland also protected one part of the country from the pandemic with travel restrictions. At a national level, NZ also failed in terms of keeping the pandemic out of the country – in contrast to Australia (at least in 1918) and some other parts of the Pacific (see this article). In a modern age with jet travel, achieving such controls is probably even harder, but further research on NZ’s options for the use of border control measures and protective sequestration is probably warranted (there is published research of NZ measures to follow-up and screen arriving passengers during the 2009 pandemic but more needs to be done). For less severe pandemics there are complex trade-offs that will have to be made by the government in terms of the adverse impacts of various control measures (eg, relating to school and workplace closures – see for example this modelling study). 3) Be prepared for future pandemic waves: During the First World War, a mixed bacterial vaccine was delivered to some NZ troops. Somewhat surprisingly (given the state of vaccine technology at the time), it seems to have been effective in reducing death rates from the 1918 pandemic (see this modern analysis for the evidence around this). But use of this vaccine was not continued and so an opportunity to reduce deaths from the subsequent February/March 1919 wave in Europe was not realised. While we now have a better understanding of waves of pandemic influenza – it was still known at the time that multiple pandemic waves could occur. Fortunately in the modern era it may be possible to institute a range of control measures after wave one of an influenza pandemic. These include vaccination for the pandemic strain, vaccination for pneumonia (pneumococcal vaccine is now routine for children in NZ), restocking supplies of antivirals (if appropriate), and intensifying mass media campaigns that promote hygiene and other measures to reduce transmission. In summary – we have reflected here on just some of the possible lessons from the 1918 pandemic. Yet there is probably still much to learn from this unusually severe event and how country-level pandemic preparedness and control plans might be optimised. Rice G. Black November: The 1918 influenza pandemic in New Zealand. Christchurch: Canterbury University Press, 2005.